Oh, my goodness, how I loved this book. I think that everyone should have a touch of Granny in them and that every child needs someone like Granny throughout their childhood. I have to qualify though that as much as I would love to know granny, I would not want her for a relative unless I was seven (almost eight). One adventure was traded for another upon Elsa’s birth. Granny had kind of stunk as a parent to Elsa’s mom as she was primarily traveling the world round on medical aid missions. Elsa is her opportunity to make up for some lost family time. Not surprisingly, with Granny’s uhhhhhmmm “adventurous spirit”, in close quarters she tends to get on absolutely everyone’s last nerve. Fortunately, though, Elsa knows "that all of the things that Granny did were for [her] sake". People that live a life full on are known to step on toes occasionally, in actuality everyone can, but crazy grannies do it more; hence the need for her to say that she’s sorry. As Granny is coming close to death she creates a treasure hunt for Elsa. Don’t forget that Granny loves treasure hunts! The tasks that Elsa is given help her to understand Granny and the people who live around her in a better way while simultaneously offering closure for those from whom Granny seeks forgiveness. It brings a whole group of people together who had lived separate lives within close proximity. Each one of them shared a common tie to Granny but were not much more than neighbors in the same building. Through this adventure, a community is born. Through this adventure, a child is healed. 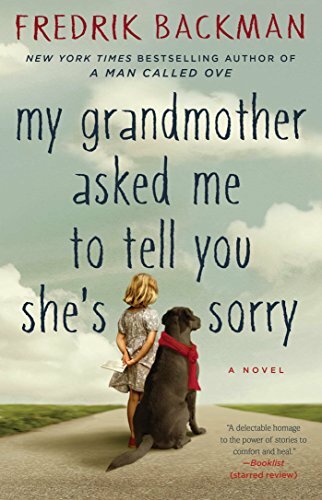 Fredrik Backman, a blogger and columnist, is the New York Times bestselling author of A Man Called Ove and My Grandmother Asked Me to Tell You She’s Sorry. Both were number one bestsellers in his native Sweden and are being published around the world in more than twenty-five languages. His latest novel is Britt-Marie Was Here. He lives in Stockholm with his wife and two children.